Actually, WordPress didn’t change my life. My story starts in high school as a girl with a technical bent, in a small country town just as computers were becoming mainstream but well before they were in everyone’s home. (I was in high school when Apple came to school and showed off this new fangled thing they called a mouse…). 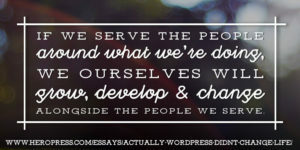 We were … Continue reading Actually, WordPress didn’t change my life.